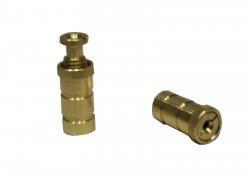 This is the Anchor Brand replacement pool cover brass anchors. We will sell these in Quantity of Five. They are 3/4" diameter, 1 1/2" long, With the bolt out they are 2 1/2" long. These are NEW parts.